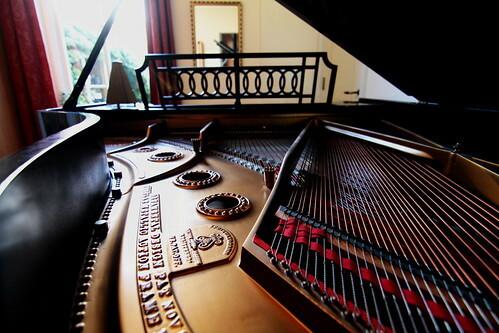 Piano concert this Sunday 18th November 2012 in Zeist — the atelier of Henk Hupkes — and visit Anne’s Steinway. On the other side of the world, I am following what goes on in the Netherlands. This coming Sunday 18th November 2012, there’s a concert in Zeist, not far from Utrecht where I used to live. I can’t get there from Hawaii but I hope my friends will visit. When they do, please also visit the room full of grand pianos. 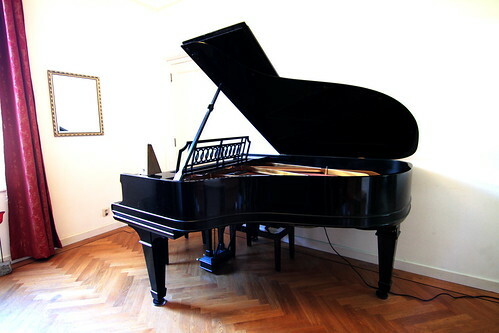 What lives in Zeist, where the concert will take place, is my beloved Steinway Grand. It’s been tuned, regulated, voiced, and ready for sale at euro 19,500, a far cry from what I listed when I was trying to sell it on my own in Utrecht after I tried to say goodbye. e-mail to reserve Suggested donation 15 euros. Saying goodbye to a Steinway Grand by finding the next owner and avoiding the fate of the worst kind…. Throughout the years, from the Steinway Welkomfest in Bussum to our house concerts in Utrecht, visiting concert pianists brought out the depth and breadth of sound — warm nostalgic tones from the Romantic era. As I scout the market for its next owner, I can’t help thinking that once again I am saying goodbye to a friend via cyberspace. I am unable to play it, caress it, or hear it. I am on the other side of the world, answering e-mail enquiries and writing to those who might have a hand in its future. A friend sent me 4 consecutive e-mails of the following video from the New York Times. He really wanted to make sure I got it, I guess. It’s not a nice way to say goodbye, and I surely hope it will not be the death of mine. Another friend sent me the NY Times article that wrapped around the above video: For More Pianos, Last Note is Thud in the Dump. 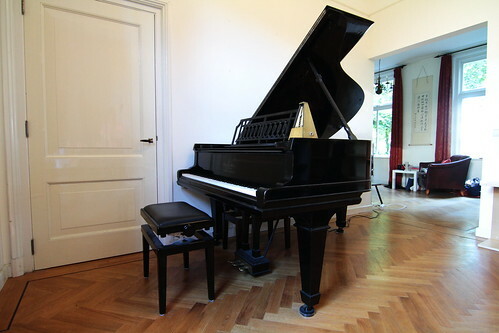 Regularly tuned and maintained & used for professional recordings of Bekkers Piano Guitar Duo and intimate concerts in Monument House Concert Series (twice a year). Additional background information, including history and sound clips. Please use LEAVE A REPLY box below for enquiries & appointments. These will NOT be posted but owner will reply. First time buying a Steinway? Download the Steinway Buyer’s Guide for free. Heleen Verleur’s Prelude and Fugue in D minor for solo piano brought back memories of Anne Ku’s first concert in Bussum, Netherlands. More than 10 years later, she records it on her Steinway in Utrecht, Netherlands while remembering it in Maui. Before I left the Netherlands, I recorded a CD of three piano duets with Carol Ruiz Gandia for my Call for Scores project followed by several solo pieces that were easy to sightread. Three of the solos came from my collection of music by the Amsterdam-based composer Heleen Verleur. 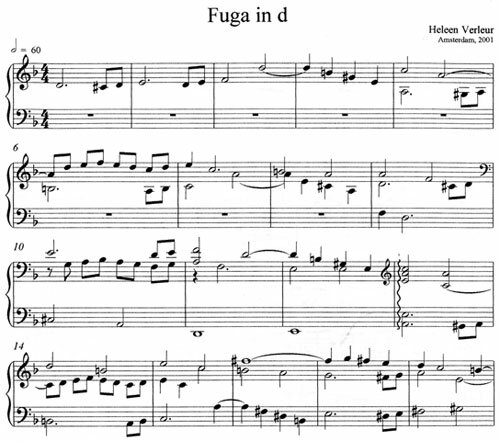 What a joy it was to find Verleur’s Prelude and Fugue in D minor on my bookshelf! Sightreading the set brought back memories of my first concert in Bussum, Netherlands in March 2002. Back then, I was still working full-time as an energy magazine editor, shuffling between London where I was based to the New York head office and various conference locations. Music was a pastime, a favourite hobby, and an insatiable passion. If you visit our Bekkers Piano Guitar Duo website, you’ll see that the very first concert is listed in 2002, a year after I met Dutch guitarist Robert Bekkers. That “afternoon of diversity” concert in a Lutheran church in the town of Bussum (east of Amsterdam) featured the music of Heleen Verleur for piano solo and piano and violin as well as that of Astor Piazzolla. In preparing for that concert, I wrote of my expectations of that event where the guest of honour was my childhood friend Leslie from Seattle. More than 10 years after I met Robert Bekkers and Heleen Verleur in Amsterdam, I would like to share my interpretation of the prelude and fugue, recorded on 4th August 2011 on my 1909 New York Steinway in Utrecht, Netherlands. When I searched for “Verleur” on my e-mail programme, I discovered several e-mails of mp3 and concert announcements from Heleen. Now that I have more time in Hawaii, I hope to listen to this backlog of gifts of music, including CDs I received from various composers and performers. You could say that forthcoming entries in this Concertblog will introduce the music I have been collecting during the last 10 years of concertizing and arts management in the Netherlands. Musicians meet each other through music and collaboration. Anne Ku performed and recorded the Impromptu for solo piano before she met the composer Kim Diehnelt in Chicago. As a sightreader, I have an insatiable appetite to discover new music. Now and then, I receive a score that I want to sightread and perform for others. Such was one by the Chicago-based conductor Kim Diehnelt. Her music preceded her. This is one way musicians get to know each other — through music. At first I thought she was a conductor. She thought I was an agent or arts manager. Once I premiered her piece in Maui, I then got to know her as a composer. Over an afternoon snack at Chicago O’Hare Airport recently, the first time we met face to face, I asked her about this piece. The Impromptu was born out of a desire to capture a moment. Although a unique moment, it may very well be one we all have experienced. A friend shared a brief description of a morning scene where Bach’s Prelude No. 1 flows from the radio, a glance towards the piano where this piece sits open, a memory from long ago surfaces. In a flash, all these combine into a new awareness of how the current self may meet the tasks of the day. It is the moments of Between-ness that fascinate me. I hope performers – and listeners – will savor the ‘between-ness’ created with the appearance of each new note. What’s interesting is that when Kim Diehnelt composes an ensemble work, she actually sees the score as an ensemble — not from a keyboard like many composers do. We discussed the importance of readability for playability down to the size of the measure. If it’s too long, the player may think it’s slower than usual. As a conductor, she knows what she’s looking for and what she wants to hear. When she sits down to compose, she can see it and hear it. Listen to my recording of Kim Diehnelt’s Impromptu below. Piano duets often have origins elsewhere. 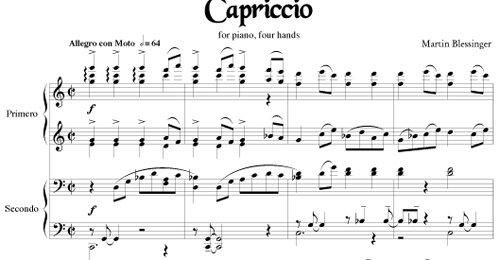 Martin Blessinger’s Capriccio for piano, 4 hands came from the 3rd movement of a violin and viola piece. Listen to an extract recorded by Anne Ku (primo) and Carol Ruiz Gandia (secundo). It has been nearly five months since the deadline of my Call for Scores has passed and 3.5 months since the Piano Soiree in San Francisco where several of the piano duets were played. And it has taken THAT long to find another pianist to study, play, and record a duet. During my 2.5 months in Utrecht, Netherlands (end May – mid August 2011), I actively sought pianists to sightread the 42 duets from 30 composers. Aside from those too boring or too difficult, there were many candidates for a replay. After gauging the sightreading experience with different pianists, I decided which ones deserved another re-evaluation. Martin Blessinger‘s Capriccio is a fun piece that challenged me enough to recruit someone else with whom to prepare and play together. Below is an extract of the recording on my Steinway Grand in Utrecht, Netherlands with me as primo and Carol Ruiz Gandia as secundo. This piece is a transcription of a movement from Tapas, a suite of short pieces I wrote a few years ago for violin and viola duo. It struck me that one of the middle movements of the work, Capriccio Pizzicato, would work particularly well for four-hand piano. This is an ensemble that has always appealed to me for personal reasons. 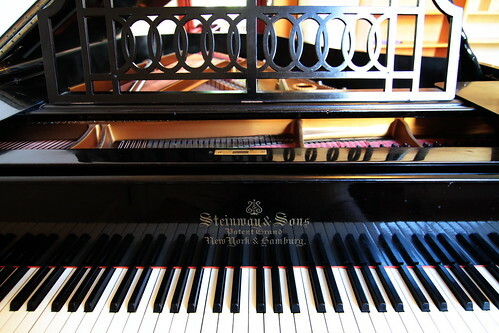 I was a piano major as an undergraduate, and some of my fondest memories are of reading through four-hand piano works with other members of the piano studio at SUNY Stony Brook. In studying for this piece, I focussed only on getting the notes correct, labeling ledger lined notes and polite accidentals whenever possible and necessary for clarity. When we got together to play, we decided to make a small comma after the third quarter note in bar 6 because it felt like a breath was needed. These are decisions that can only be made after studying a piece (not sightreading). I thought I had the difficult part until I saw what the secundo had to do in bar 33 and 34 while I played nothing. Spanish pianist Carol Ruiz Gandia decided to memorise those octaval 16-th notes while I stayed put. Moving the page distracted her. So I waited until bar 36 before I moved the page. We decided to add some dynamics in bar 58 where it was already forte. We went back down to a mezzo forte and made another crescendo to a forte in bar 60. These dynamics added to the piece. In bar 61, we went back down to a piano and steadily climbed until a big fortissimo in bar 64. The secundo immediately dropped back to a mezzo piano (subito) and I joined her to crescendo to another fortissimo in bar 65. And again. These dynamics are essential to make this piece exciting to play and listen to. On top of page 7, we retracted to piano and then pianissimo as we descended. Listen to the 3rd movement Capriccio Pizzicato of Tapas from which this duet came. I rather think the entire 4 movement piece for violin and viola could be arranged for piano duet. I particularly enjoy playing fugues in duets. In the meantime, having discovered its origins, I will share it with my violin and viola friends in Bristol, where just a year ago I was sightreading piano trios and quartets in their newly renovated Georgian home. Schroeter’s Waltz for 4-hand, 1 piano is reminiscent of the romantic era, a piece that is easily sightreadable and playable after some cosmetic changes. Listen to an extract played and recorded by Anne Ku and Carol Ruiz Gandia in Utrecht, Netherlands. Note: This blog post has been taken down due to protests by the composer. 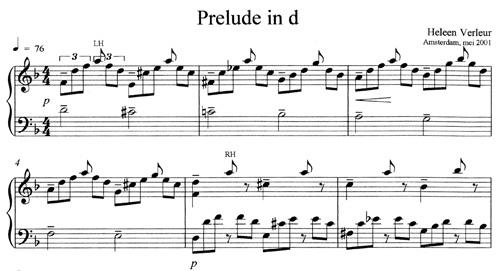 Among the 42 piano duets by 30 composers submitted to my Call for Scores project is a delightful, easily accessible (readable, playable, and appreciable) quatre mains duet by Brazilian composer. This Los Angeles-based composer’s style is reminiscent of the romantic era familiar to many members of the piano club in San Francisco. I noticed how easy it was to play this piece in Maui, San Francisco, Utrecht, and the Hague where I introduced this new work. There are many repeated and modulated sections. The secundo sets a firm pace. It is with great reluctance that I have decided to erase the rest of this blog post, remove the sample score and recording. I had spent quite some effort getting the music read, interpreted, and reviewed by enthusiastic pianists in Maui, San Francisco, Utrecht, and the Hague, culminating in a recording made with Carol Ruiz Gandia on my Steinway in Utrecht. However, the overwhelming number of protests, to the tune of 50 unpleasant spam e-mails from the composer, tells me that sometimes feedback and publicity is not appreciated.